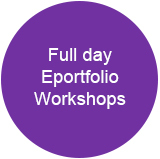 The full-day Eportfolio Workshops are hands-on and will require that participants have a computer/laptop, and are based on the Mahara eportfolio system. Eportfolio Services can provide the Mahara eportfolio system for this training, or the training can be done using your Mahara eportfolio system. What is an eportfolio and why would I use one? Why use eportfolios for eAssessment? This work by eportfolioservices.com.au is licensed under a Creative Commons Attribution 3.0 Unported License.